Sterling Silver 19mm Engraved Disc Pendant - engrave up to 3 lines! POSH Disc Pendants are quite simply "must-have" everyday jewellery items with a touch of luxury! Wear one singly or bunch 'em up for more 'wow'. The discs measure 19mm in diameter and are beautifully sturdy. Personalise with up to three names or lines of text per disc. 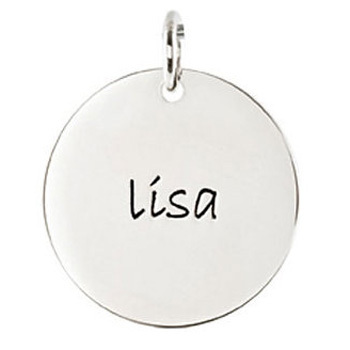 A short message or date is able to be engraved on the back for a small additional charge. Your stunning POSH Mother Jewellery not only comes gift-boxed, but with it's own polishing cloth to keep it looking gorgeous! -Displayed cost is for an engraved sterling silver pendant only (birthstones, yellow gold pendants, white gold pendants and all chains are extra). -Lettering is "bradley hand" font and only in lower case - you may have the engraving blackened for impact or leave as is for a more subtle "traditional engraving" appearance. NB: Please allow up to 4 weeks to receive your personalised Posh Mommy jewellery OR select our Posh Mommy Express Service for an extra $35 and have your Posh Mommy item despatched in 14-21 days.